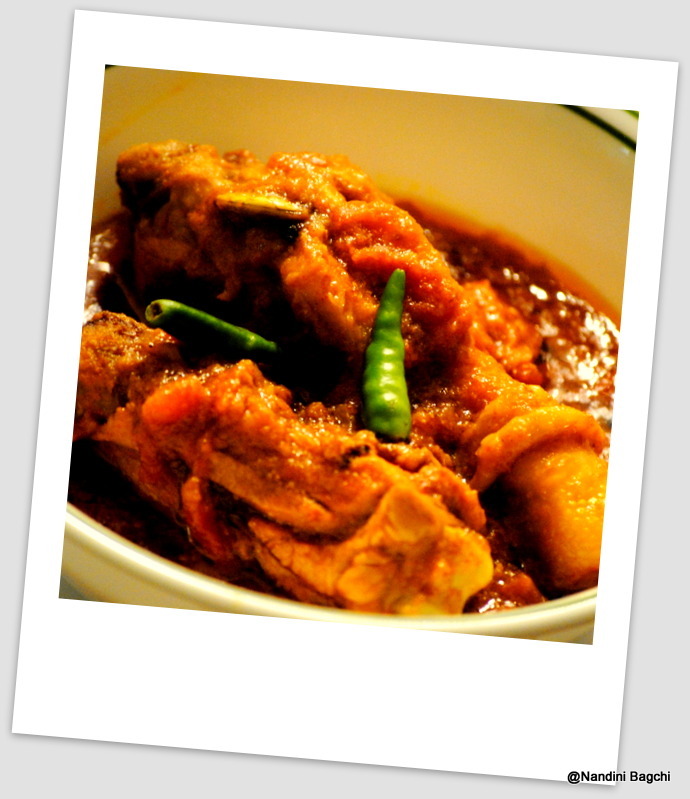 Last night dinner was like being back in time and when I saw the excitement in Prithwish’s eyes with regards to dinner, I was transported back to my childhood days, except, this times roles had changed, I was no longer that wide eyed, curly hair little girl all excited about murgi jhol, I was the one cooking it.. Though I am no way near to my mum when it comes to cooking, but I did a pretty decent job..
Slit the chicken pieces diagonally and then mix them with the marinade and leave it in the refiregerator for about 45 mins to an hour..
Oh and I almost forgot, when I came here, my mum had stuffed my suitcase with this bled of spices, which till date, I have no idea what it contains but if my smelling senses are working, it is a blend of cloves, star aniseed, cardamom, cumin and dried red chilly.. 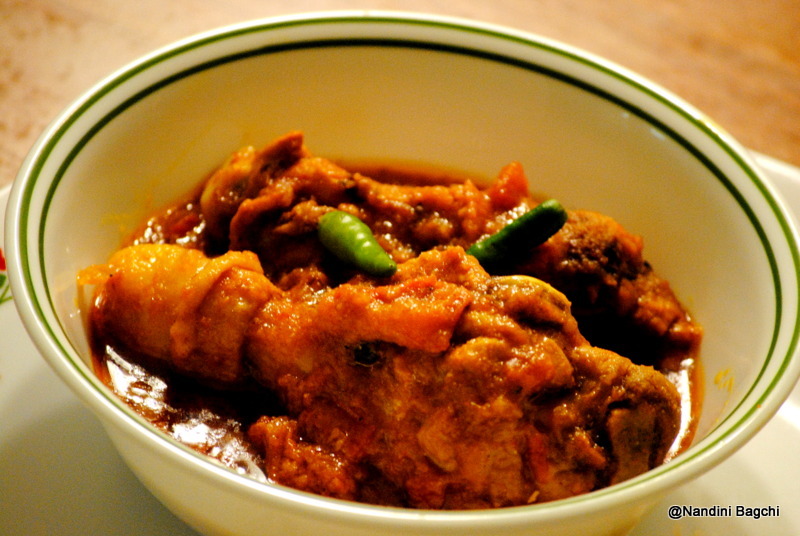 The smell is fantastic and goes great with chicken, but if you do not have ready access to this, then try out MDH chicken Masala, comes pretty close but be careful not to put more than a teaspoon as it contains generous helpings of corriander..
Leave the chicken to marinade, then heat a wok/ kadhai add 3 tablespoons of mustard oil/or any oil you use fry the onions and as they start to brown all the ginger and garlic. You know what form my own experience I have seen that if you grate in the ginger and garlic the aroma is far better. Once this mixture starts to brown, just strain them from the oil and let it cool. Then blend them in a mixer and you will get a brownish paste. 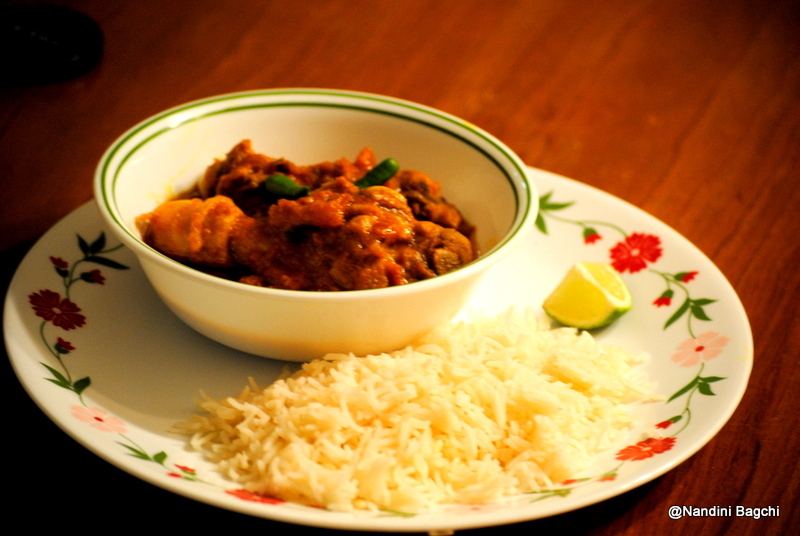 murgi jhol and bhaat ( chicken curry and rice) what more does a Bengali need ! !